Day 214 of 365 Cards has a challenge to use this sketch on a card. Have to admit it was hard for me...just not really my style I guess. I'm not a "white space" scrapper anyway, and the position of this white space was a bit tricky for me to pull off. 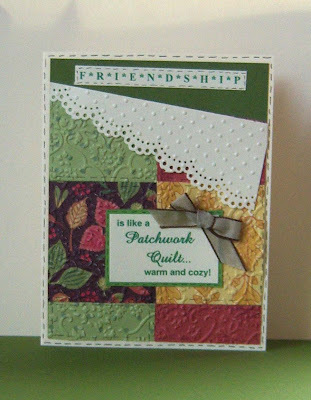 I hope I didn't warp it too much turning it upside down and using big images around the border. Oh, well it was the best I could come up with. I hand cut red, brown, yellow, and orange leaves.....added veins with a marker and inked the edges with brown ink. 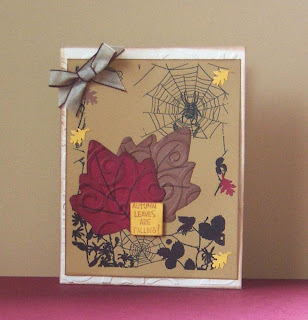 I then put the leaves through the cuttelbug using the swirls folder and inked over top of the swirls in brown. 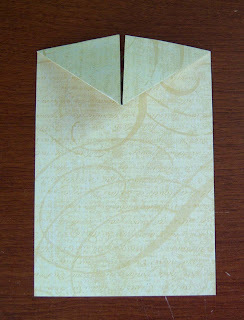 The card is done in swirls -- edges and swirls inked in brown. 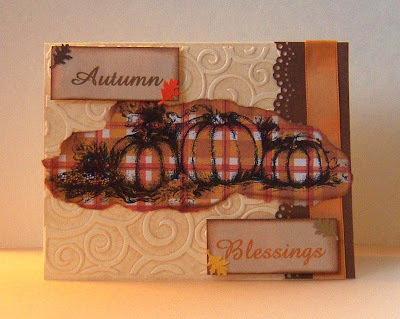 The sentiment (Autumn Leaves from Happen Stamps) is stamped on yellow card stock and layered 4 more times....all edges inked in brown. 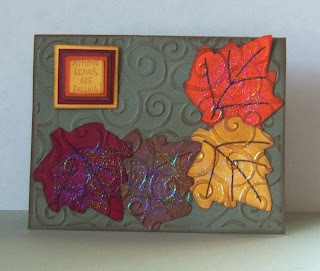 I also added Kaleidoscope Transparent Embossing Powder to the leaves to make them sparkle. When I saw this image on the Two for Tuesday site I immediately thought "garden." 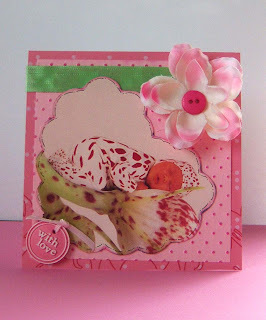 With the temperature feeling cooler outside and the leaves changing I couldn't get in the mood for a spring garden card. 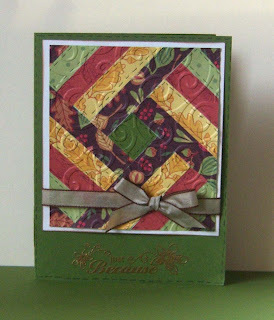 So here's my take on a fall garden card --- I'm really not sure if I like it or not, but I got tired of messing with it..... I think it's growing on me though. 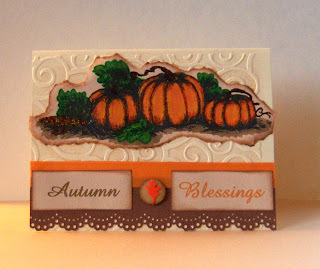 The challenge (and free pattern) over at 365 Cards today is to use their pumpkin template on a card. I decided to enlarge it a bit and make my card out of the pumpkin. I don't get into Halloween, but I do like pumpkins and other fall looking items! 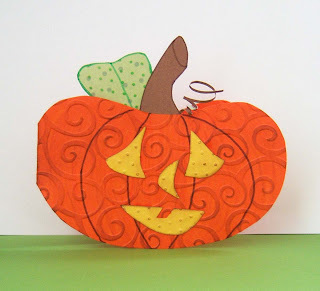 I cut the pumpkin (on a fold so it opens into a card) from orange paper and used colored pencils to add dimension to it. 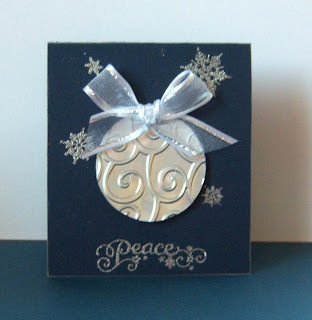 Then I embossed the whole thing using the swirls embossing folder. I used brown ink and brushed over it, just to make the swirls "pop" a little. Cut out a stem, leaf, and the face parts and wa-la you have a cute little pumpkin face. O.K. so I'm one of those people that does not want to see Christmas stuff out in stores in July (and I did!). I was recently heard complaining that a store I frequent skipped fall entirely as they have all their Christmas gifts/decorations/etc. out already but no autumn stuff! I (secretly) "vowed" not to look at any Christmas items on Splitcoast or any of the clipart sites I visit till much later in the year (something like the end of November!). It's certainly NOT that I don't like Christmas, I just don't like to jump straight from summer into Christmas without passing through fall and having Thanksgiving! The bulb is made out of a pop can - cut with a circle punch and embossed with the swirls folder. 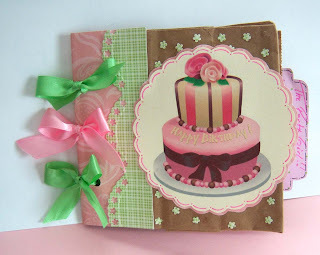 The last of the birthday celebration challenges at Cuttlebug Challenge --- a centerpiece for the table. Usually the food takes up the whole table at our birthday parties. With streamers from the chandelier to the corners of the table, cake on one corner, and food covering the rest of the table I was wondering WHERE I would put a centerpiece!?! Finally got the idea to make a low decoration for the back of the table - behind the food. I usually decorate this area anyway with something that coordinates with the theme. 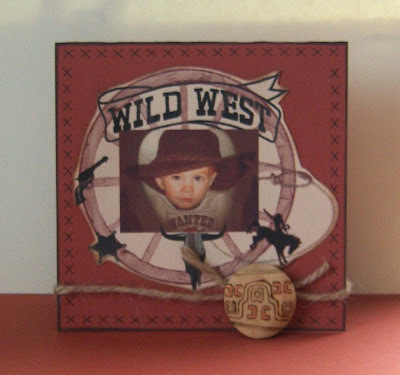 So here is my "centerpiece" creation that won't actually be in the center! 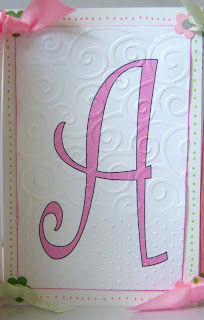 I printed the letters of my daughters name on three different colors of cardstock and embossed them in the cuttlebug. Each letter has polka dots on 1/4 of it and various other folders were used on the other 3/4. 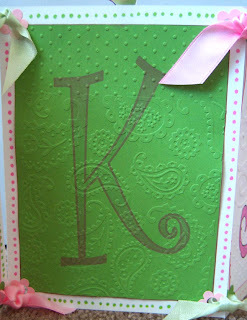 The polka dots alter between being on the top of the letter and then the bottom of the next etc. 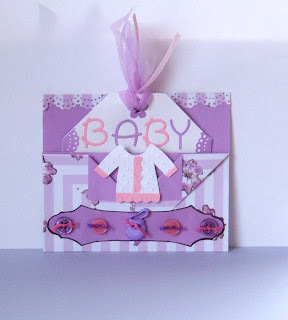 Each letter is inked along the edges with pink ink and attached to white poster-board with polka dots added around them with a marker. 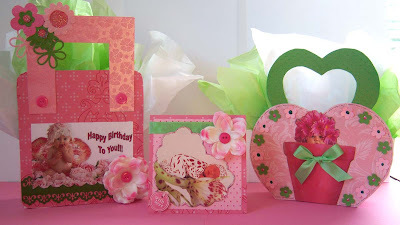 To attach the cards together...I punched out pink and green flowers and glued them to the corners of each card. 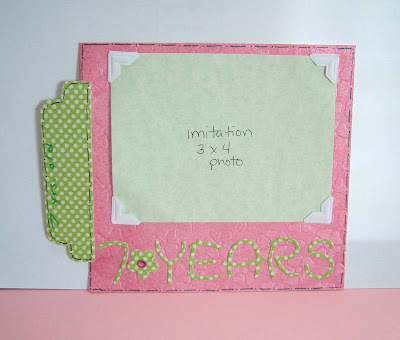 I then used a round hole punch and punched through the center of each. The last step - thread alternating pink and green ribbon through the holes and tie. The last thing I did was cut out four more baby images from my Anne Geddes book and "pop" them out the top of four letters. Now we're all set for a birthday party! 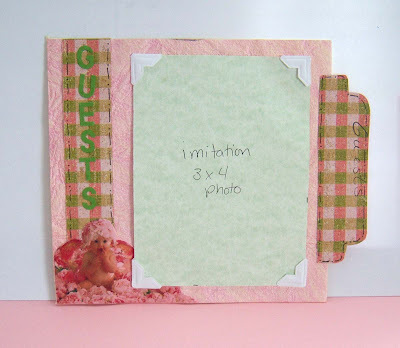 I made this simple card holder to put a set of the quilt cards I made in. The pattern is here....though I altered it a bit to fit my needs. 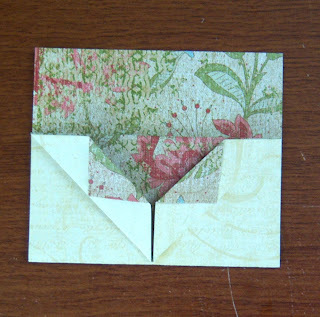 I also added a pocket on the back to put my envelopes in since they wouldn't fit inside. 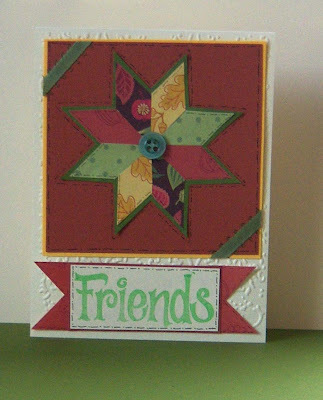 I used a quilt block stamp from Big Lots and my versa mark to make the pattern on the paper. The free image this week - over at "There's Magic in the Air" is Eldon with a flower. 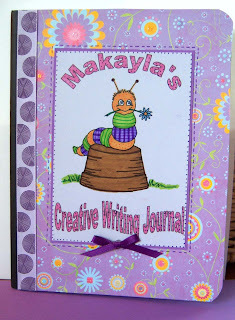 This week I colored the image with markers and used it to decorate a notebook I needed for my daughter's school work. I love how Nina (the artist who drew the little fellow) gave Eldon so many different outfits......so I chose to use polka dots, plaid, and stripes on my little fellow. 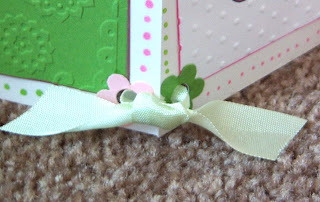 The challenge was to use ribbon and a bow --- the ribbon is along the left side - the bow at the bottom of the picture. 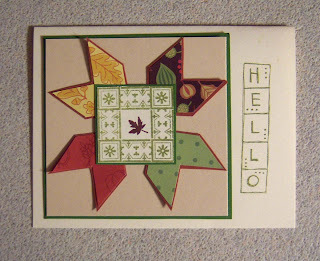 I printed some clipart off of Leaves of Time to make a few fall cards. On the first one I printed the image on printed paper - no coloring required. 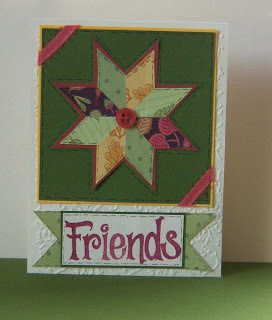 For the second card I printed on light tan paper and colored with markers. 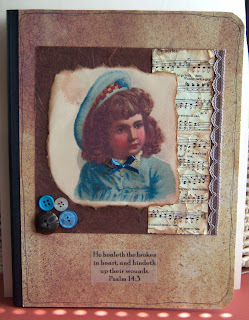 On Both I tore the image out and inked the edges and added to an embossed (using brown ink in the embossing folder) card front. My questions is: Which do you like better - the one I colored or the one on printed paper? My family all voted for the one I colored - What do you think? 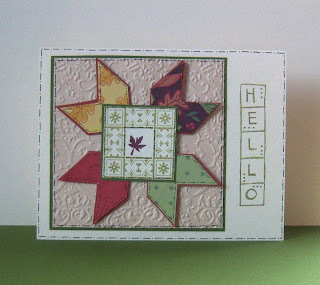 I've been quilting lately............well not litteraly, but with paper! 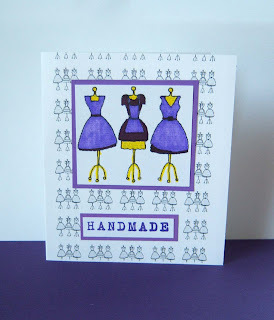 I have two people I need to make a set of cards for - one is the wife of a guest speaker coming in two weeks....and the other a lady at church who along with her husband has been so generous to us. She's always giving little gifts (eggs, stickers, baby dolls[to my daughter] etc.etc.). Since I don't like to "be in debt to people" I try to give back when given too. Anyway, the little taste of fall we've had has me on a quilt kick ---nothing nicer than a warm quilt, cup of hot tea, and a good book - right? 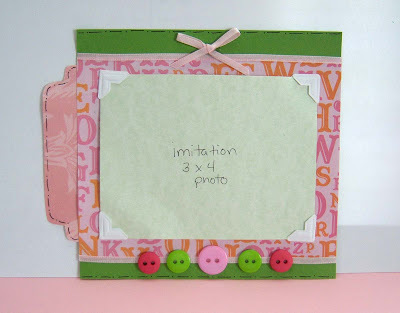 Here's a great tutorial for the above card. BUT....I think I can vindicate myself. 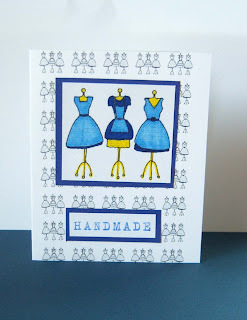 I took a picture of the third card without any stitches or embossing....just to see how much they really added to the card. The picture is below....you decide if it was worth the extra time! 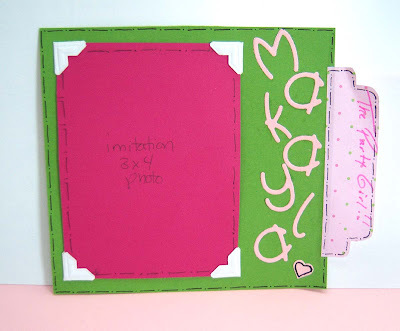 The next segment of Cuttlebug Challenge is to make a mini album in your party theme. 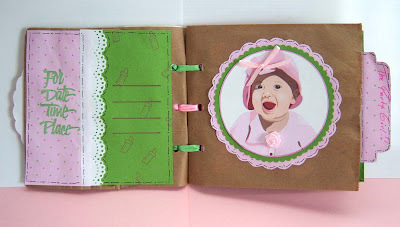 I almost didn't do this one, but then inspiration struck and a Paper Bag Book took shape! I don't have pictures for it yet (the party isn't till November), but I used a piece of card stock (3x4) as an imitation throughout the album. 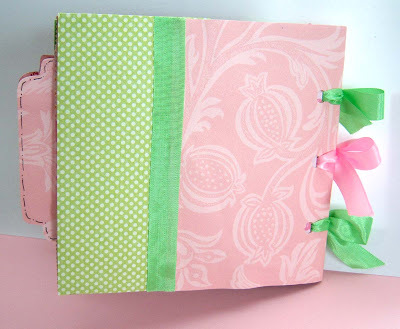 You see that tab on the side --- it's a page tucked into the pocket of the paper bag. Last night I didn't feel well, so rather than waste time sitting around sick....I sat down an played with one of the pictures (cropping, changing it's color, adding shadows etc.) and then with a set of western photoshop brushes. I inserted a few of the brushes into my Photoshop program and changed their color to match the photograph. The rest of the work (layering, arranging etc.) was done in Microsoft Word. 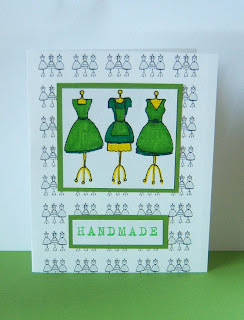 I used my stitching guide to add faux stitches around the edges of the card and then inked the edges with black ink. The extra "bling" was a piece of old jewlrey from a bag my husband found at a junk store near us. 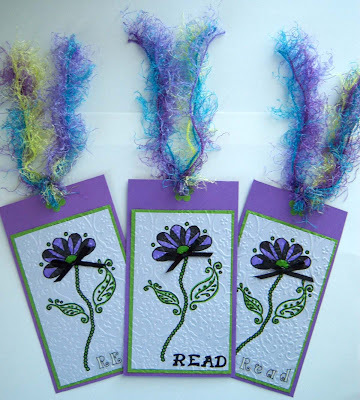 The free clip art over at There's Magic In the Air is a doodled flower. I decided to make something other than a card out of it this week. Since the image is one with clean and simple lines I made a clean and simple bookmark out of it. I didn't have any gift bags on hand to alter, so I decided to make up my own. Being that my theme is a baby theme, I went with some Anne Geddes images --- cut from a big picture book I purchased at a thrift store for $1.49 specifically for cutting up. The image on the lg. bag is the only one I could find (for free) that went along with my theme. It's from here. I made my bags using the technique from yesterdays post. 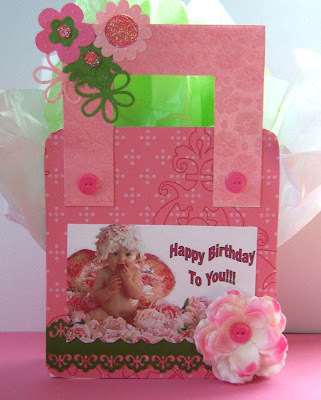 I've discovered a "new" way to give cards as a gift....Or rather a new container to make to put my cards in.....shape boxes. 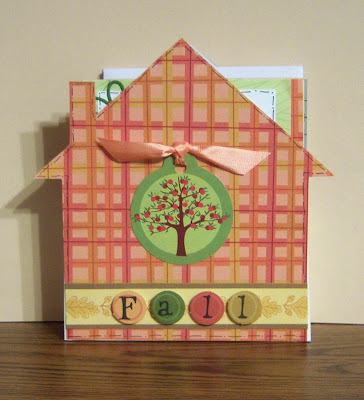 I have several designs I'm wanting to try....this post is about the house box I made. 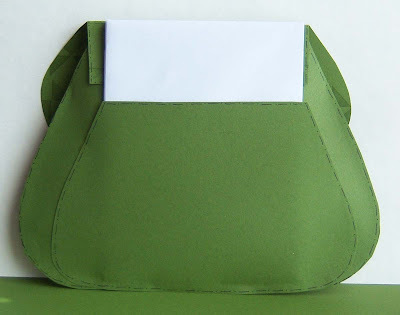 --Enlarge the shape to the desired size and print. 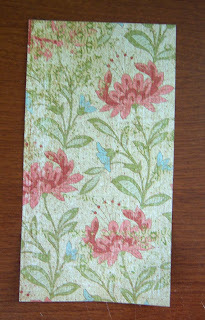 --Next cut a strip of posterboard 11 1/2 inches long and about 2 inches wide. 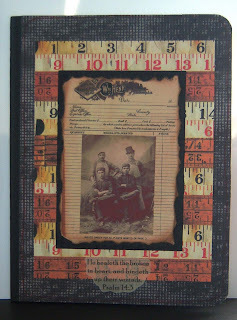 --Fold these score lines in...this is where you will put your glue when attaching to the front/back of box. 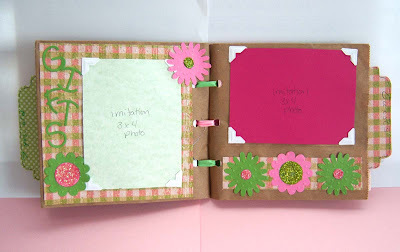 --Center your box front on the long strip and mark your strip on each side. 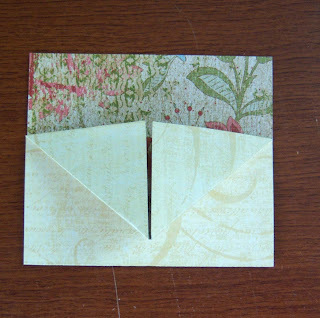 --Score these lines and fold your strip up to form both sides of your box. 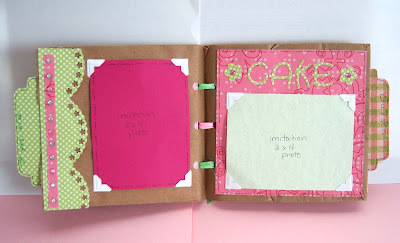 --Glue the front and back to your box bottom/sides. 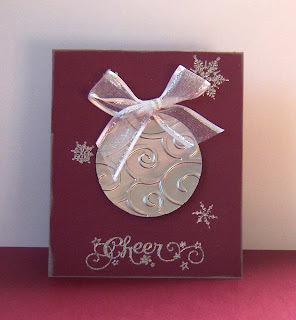 --Lastly cut patterned paper to cover the front and back of your box and decorate! 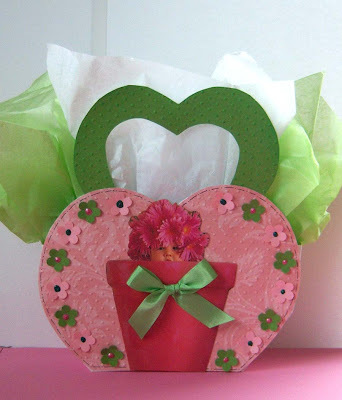 Very easy/simple and very versatile in that you can make the box as big or as little as you like --- add handles for a gift bag look. 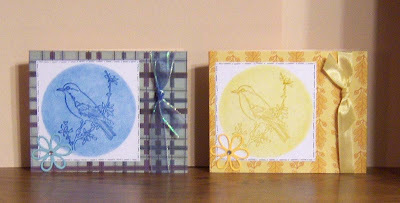 I used my Martha Stewart Bird Stamps and the chalking method described here. 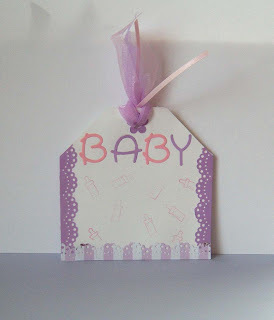 Stay tuned for a couple gift bags I made using this same technique! I wanted a special gift to give a good friend of mine whose birthday is in August. 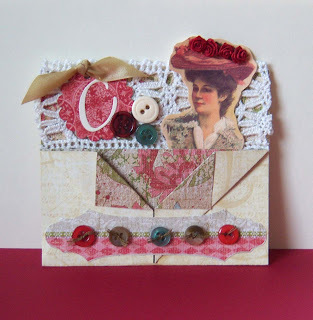 She loves to create things, loves shopping, and especially loves a good bargain. 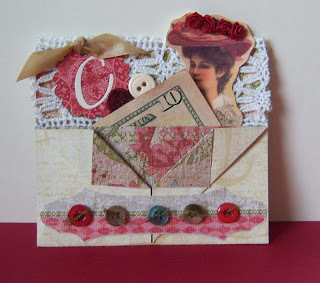 So thought I'd give her a little something to pay for some new craft purchases she may want to make! Here it is with some $ in it -- just to show you what it looks like/where the pocket is. I usually never make just one of something, so here's the second one I made---the tag is blank on this one - waiting for the monogram letter of the person I choose to give it to. 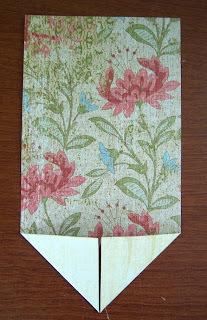 Here's a picture tutorial of how I made these vintage pockets. 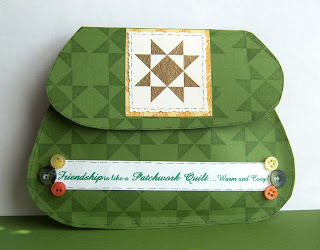 Step 6: - Glue sides down and front "triangles" ---Decorate! 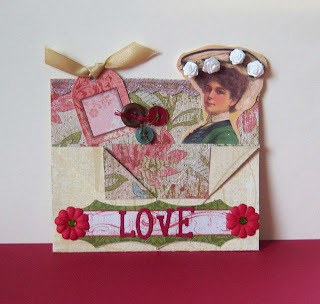 If you happen to make one of these - please link back to this post and leave me a comment! I'd love to see your take on it.